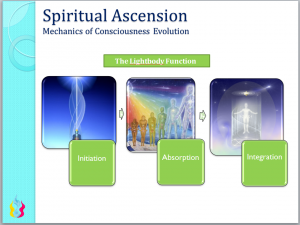 Ascension is the complex quantum mechanics governing the movement of consciousness through time and space. Consciousness is energy, as well as, energy is intelligent consciousness. When energy shifts, so does our consciousness. Time and space as we have known on planet earth is changing, and we are moving into a future timeline. Through gradual exposure to frequency activation of various stellar bodies, the planet is transformed into higher dimensional and frequency planes of existence. One can consider the multidimensional model of our reality through the study of the Universal Time Matrix and the Universal Tree of Life. The shift of frequency forces all of the planetary inhabitants to shift into the newly exposed planetary frequencies and adapt to the accumulative impact of the shifting energies. All humans have a unique Blueprint and pace to keep aligned with the planetary frequencies. Some will adapt to these frequencies while embodied on planet, while others may not. The choice lies with each of us and is directly our responsibility. We can participate or not with our personal evolution process. All that is required from the Ascension process is participation at the level you are able and that attention and focus is placed on one's heart with a desire to know the true self. As we develop Self Awareness which is the knowledge of the Self, we are developing the right relationship to the Self, and thus we can better develop our relationship with God Source. We cannot know the highest expression of our nature, until we know the deepest inner contents of our own being. Self study is self mastery and is the pathway to expanding Consciousness and awakening Kundalini. See Where Can I Start? Emotional clearing is the main process we will experience and be acutely aware of as we shift through the Ascension. Since emotional pain and imbalances are responsible for our states of dis-ease, many of us will experience illness or physical releases of pain clearing from our bodies. Some of this clearing is for your karmic, genetic or ancestral soul lineage. Some of us as lightworkers, have chosen to clear states of imbalance for the collective or for a specific group, and will feel this movement of energy transmute through us, as our energetic being is acting as a cosmic filtration system for the greater whole. 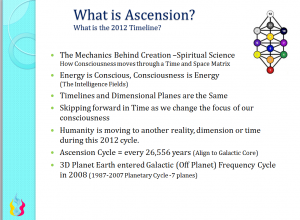 The 5D Ascension is the original evolutionary schema or Ascension Plan for the planet Earth at the end of the 2012 Timelines or at the end of the Ascension Cycle, or the end of an Age of Humanity. 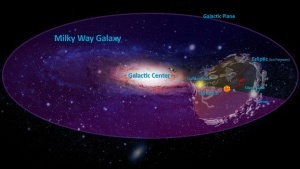 This original plan was aborted by the Krystal Star Guardians, and in my knowledge, I was shifted from my original Ascension mission in 2004 to learn how to best work for the Guardian Aurora teams who were active building Krystal Star hosting architecture for planet earth. In 2005 I was made aware the original plan was aborted and councils disbanded and reassembled to work on the new mission upgrades, called Ascension Plan B. 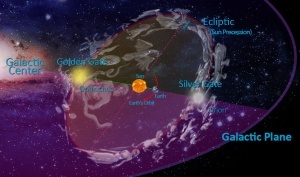 4 Planetary Rounds = 1 Planetary Cycles = 1 Astrological Age = Aeon = 26,000 (26,566) years = precession of Earth’s axis of rotation with respect to inertial space.At the end of every cycle, we become aligned to the galactic core; Stargate portals open (See Planetary Gates, and we are eligible to proceed with an Ascension timeline. Refers to the precession of Earth's axis of rotation with respect to inertial space. A complete precession cycle (One Astrological Age) covers a period of approximately 25,765 years, the so called Great Platonic Year, during which time the equinox regresses over a full 360°. The precessional movement also is the determining factor in the length of an Astrological Age or Aeon. (Note that there are 12 Zodiac Archetypes that are each of the 12 Astrological Ages. We are moving from the Age of Pisces to the Age of Aquarius.) The Precession of the Equinoxes is caused by the differential between the gravitational forces of the Sun and Moon on the Earth. ↑ August 2005 Newsletter "Surviving the Ascension Process"
This page was last edited on 27 March 2019, at 21:09.